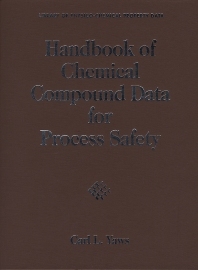 This book provides comprehensive safety and health-related data for hydrocarbons and organic chemicals as well as selected data for inorganic chemicals. Carl L. Yaws, PhD is Professor of chemical engineering (retired) at Lamar University, in Beaumont, Texas. He has industrial experience in process engineering, development, modeling, and design at Exxon, Ethyl, and Texas Instruments. He is the author of 36 books and more than 1000 technical publications (papers, presentations, and chapters in books) in process engineering, property data, and pollution prevention. He is a leading authority on property data of chemical compounds for use by practicing engineers and scientists.